I've set up our camera to just overwrite older files. But just today, it's giving the "cannot write to disk" error. Disk full by chance? Where are you writing too? Shared PC or USB drive? Or SD card? How big is the card? Have you tried erasing the card and testing it again? 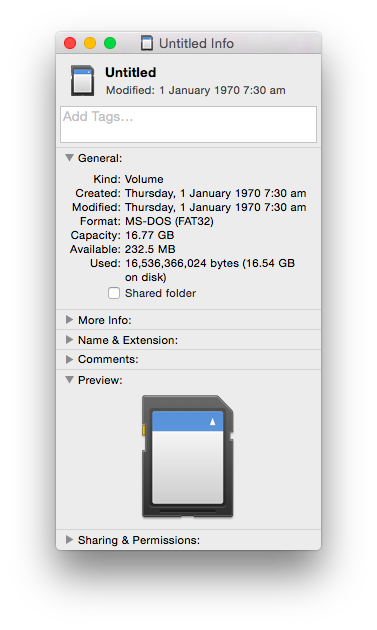 16GB. But that shouldn't matter, right? Coz I set it to just overwrite older files? Ya it should unless somehow it's still getting full. Can you look at the contents of the card on a PC and see whats on it and size free and used? I just checked it and it's almost full. But what's the sense of setting it to just overwrite older files if I have to check also if it's getting full everytime? I'll try deleting some files and see if the error appears again. Okay, I browsed & tried to delete some files using my MacBook Air, but it says I could only read them. Hmm, maybe that's why the camera can't write to it too. But I don't remember changing any permissions. That's weird! Is the Read/Write switch on the SD card enabled? Mine doesn't have that. I already did my research, and might try the tape trick. WIll get back to you on Monday! Okay, did the tape thing on the micro SD adapter, and I could write now. When I put back the micro SD in the camera, it still can't write. Also, when I tried accessing the videos online, it says "No video clip on your microSD card." I just hope the problem won't occur again when it's about to be full! Ok. Let us know if it happens again. If it does, you might contact D-Link and ask them about it. But yeah, I'll contact D-Link for suggestions/tips.